The graduate programs at Misericordia University combine a sound academic base with the necessary professional skills one needs to succeed in their chosen profession. Graduates of our master's degree programs learn leadership skills and are mindful of their responsibility to serve others through their professional and personal lives. Several of our graduate degrees are primarily offered in traditional formats for full-time students. Students enrolling in these five-year, entry level master's degree programs earn both a bachelor's degree and a master's degree in five years of full-time study. Misericordia University is the region's leader in adult education. The College offers several master's degree and certificate programs in adult-friendly formats, including evening classes, one-weekend-a-month sessions, and on-line study. To apply to the PA program, review the admissions requirements before accessing the application link below. Please note: Even though the CASPA 2018-2019 application cycle has closed, Misericordia University has an agreement with PAEA/CASPA that allows us to accept applications outside of CASPA to fill the remainder of out 2018-2019 cohort. If you desire entry into the MU PA Program this July, we encourage you to submit all required information through the MU internal application process. The Physical Therapy program is a 6-1/2 year professional program resulting in a bachelor's degree and a doctor of physical therapy degree. During the first 3-1/2 years, the student completes the requirements for a bachelor's degree in an area of the student's choice. The student enters the professional curriculum in the spring semester of the fourth year. The DNP program is designed to accommodate the needs of busy health care professionals and in response to growing national need for advanced practice nurses, and is being offered in two tracks. The 27-credit part-time Master of Science in Nursing (MSN) to DNP track can be completed in two calendar years while attending the fall, spring and summer over six semesters. 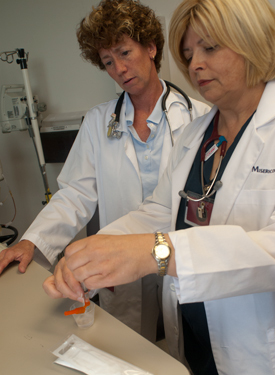 An optional nine-credit specialization in nursing education – the only DNP program offering this specialization in northeastern Pennsylvania – is also available for advanced practice nurses who wish to become educators on the collegiate level. The OTD curriculum is composed of 21 credits of "core" courses that address the competencies required of leaders and advocates in the profession. These courses address advanced theory, advanced research, program development and evaluation, occupational science, and public policy and advocacy. Capstone coursework requires the integration of these content areas into a clinical project, which is formally evaluated and presented through professional presentation and/or publication. Each student also completes 9-12 credits in either a pediatric or geriatric specialization, for a total of 33-36 credits for the doctoral coursework.